Ford will officialy begin production of the 2012 Edge with the 2.0-liter EcoBoost engine sometime later this month. Ford has announced that the 2012 Edge will be available with the 2.0-liter turbocharged four-cylinder EcoBoost engine that achieves, with front-wheel-drive, 21 mpg in the city and 30 mpg on the highway (opting for AWD will bring down those numbers by around 1-2 mpg). The 2.0 EcoBoost, which is also under the hood of the larger Explorer, churns out 240hp and 270 lb-ft of torque and is mated to a six-speed automatic transmission with an active warm-up system to reduce internal friction at start. There&apos;s also an active grille shutter system that closes as vehicle speed increases to improve aerodynamics and fuel efficiency. 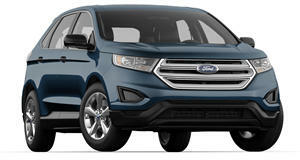 The Ford Edge with the four-cylinder EcoBoost engine first made its debut at the 2010 Chicago Auto Show and was slated to go on sale by December of that year, but production halted for a couple years and now the upcoming EcoBoost-powered Edge is scheduled to arrive later this month. There’s certainly a lot to like about the Ford Edge – but we wouldn’t go as far to say it’s the top vehicle in this segment. Brains go a long way in today's world, but are they enough to get the Edge ahead in the segment?